Figure A7. Anhui anomaly, interpreted as the Anhui slab, with (horizontal) [vertical] cross sections through (A)[D] the UUP07 p-wave) and (B)[D] the combined SL2013 and S40RTS s-wave models at 730 km; C) the location of the modern geological record that we interpret to have formed during the subduction of the slab. 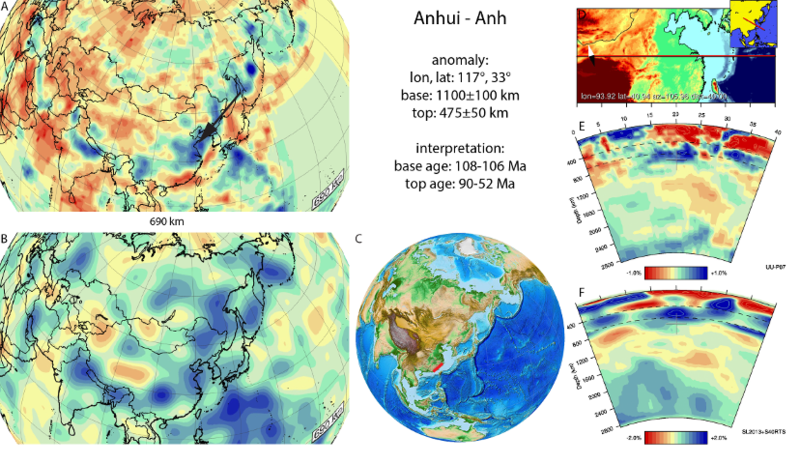 The Anhui anomaly (Figure A7) is located in the upper part of the lower mantle and lower part of upper mantle below southeastern China. It has previously been imaged by Wei et al. (2012), who suggested it may represent Pacific or Izanagi lithosphere that detached from the present Pacific slab. Its shape is irregular at the base and forms a broad anomaly at 810 km depth. At shallower depths it thins and is not imaged above the 440-km discontinuity. Towards the north, the Manchuria slab shares similar flat-slab characteristics, although the Anhui slab lies somewhat deeper in the mantle. We interpret this anomaly as the Anhui slab with the subduction history below the South China block postdating the subduction of the East China slab. Following the formation of a slab window and tectonic inversion as a result of ridge subduction and/or collision with the West Philippine block (Li et al., 2014a), subduction below South China recommenced with arc magmatism and crustal extension (107–86 Ma). The exact end of that phase of subduction is unclear. Generally, Cretaceous magmatism migrated progressively eastward towards the Taiwan area and is reported to have ceased at 90-86 Ma (Li et al., 2014a; c). Subsequent transpression is associated with the ESE-ward retreat of the Pacific subduction zone (Li et al., 2014a), which, however, corresponds to the Izu-Bonin subduction zone that started only ~52 Ma. This leaves a 30 Myr subduction gap in the region (see also Hall, 2002; Li et al., 2012), and research on this topic may require revising our interpretation of the Anhui slab in the future.